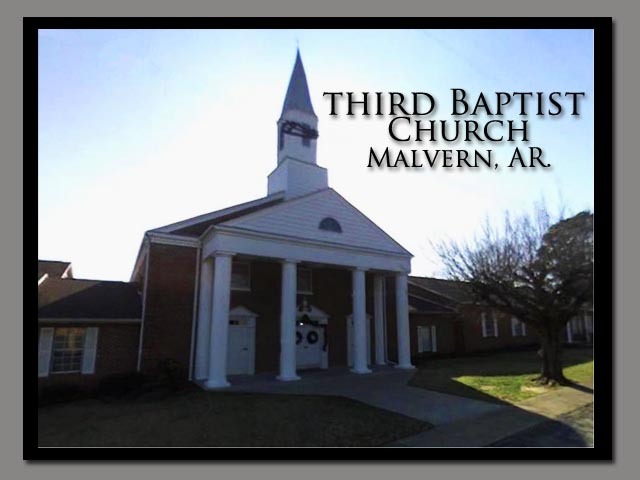 Welcome to Third Baptist Church of Malvern, Arkansas. would be pleased if you could join us in person! Sunday Night Service: 5:30 p.m.
Wednesday Night Prayer Meeting: 6:00 p.m. Check out our Facebook page at www.facebook.com/thirdmalvern. Women’s prayer time 3rd Saturday of the month at 9:30 a.m.
Men’s prayer breakfast each 3rd Saturday of the month at 8 a.m.
Encore Nursing Home Singing 3rd Monday of the month at 3:45 p.m.